Arctic sea ice retreated to the second lowest level on record but remains about 9 percent above the low set last September, reports the NASA and the National Snow and Ice Data Center in Boulder, Colorado. The ice covered 1.74 million square miles on Friday, the lowest extent this year and just shy of last year’s mark of 1.59 million square miles, the lowest since record-keeping began in 1979. The Arctic is reaching the end of its melt season. 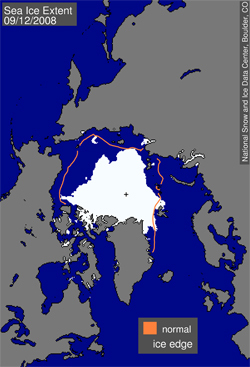 Soon sea ice will begin to refreeze and expand. Researchers say shifting currents and warmer waters are triggering ice melt, a process which builds on itself since sea ice helps reflect sunlight back into space, cooling the region. When sea ice melts, the dark areas of open water absorb the sun’s radiation, trigger a positive feedback loop that worsens melting. When there is less cloud cover, the effect is intensified. Last December scientists at the fall meeting of the American Geophysical Union in San Francisco warned that Arctic Ocean could be nearly ice-free at the end of summer by 2012, a dramatic forward revision of previous forecasts that the region would have ice-free summers around 2030. Environmentalists are concerned that the loss of summer sea ice could have dramatic implications for wildlife — like polar bear and walrus — that depend on pack ice for feeding. At the same time, some developers welcome declining ice cover in that it could make it easier to exploit the Arctic’s rich mineral, oil and gas deposits. Melting has already triggered a scramble between Canada, Russia, the U.S., Denmark, Sweden and Norway over rights to seabed resources.